This short video is recommended for FREE Iran Activists by http://activistchat.com to increase public awareness to know who Cyrus The Great was and due to his high moral and ethical values Cyrus the Great scored the highest rank among all the greatest world's leaders both in ancient and modern times. Among his many achievements, this great leader of wisdom and virtue founded and extended the Persian Empire; liberated Babylon; freed over 42,000 Jews from captivity; declared the first human rights charter; and ruled over those he had liberated with respect and benevolence. As a result these great achievements the Iranians regarded him as The Father, the Babylonians as The Liberator, the Greeks as the Law-Giver, and the Jews as the Anointed of the Lord. According to Prof. Richard Frye from Harvard University �surely the concept of One World, .... the fusion of peoples and cultures in one 'Oecumen' was one of their important legacies�. Therefore Cyrus the Great considered as the greatest political leader and liberator of all time throughout human history. It is the irony of history that in the land of Cyrus The Great, the birthplace of the first charter of the �Rights of Nations� and the �Declaration of Human Rights� over 2500 years ago, there is today no respect for human and civil rights by the Islamist invaders and occupiers of Iran. Cyrus, who was exceptionally tolerant of local religions and local customs and against slavery, is famous for freeing over 42,000 Jewish captives and allowing them to return to their homeland. His name appears twenty two times in the Bible. Were it not for Cyrus, it seems at least possible that the Jewish people would have become extinct in the fifth century BC and we would have never received their great contributions to mankind. Unfortunately, present day Iran is ruled by a small group of Islamists Mafia forces who are the embodiment of evil and have no respect for Human Rights in this land which is the birthplace of Darius The Great, Babak, Avicenna (Ibn Sina), Ferdowsi, Khayyam, Hafaz, Saadi and Rumi. As a result of Islamist tyranny, free world appeasers and D�tente with tyranny, over 100,000 executed, and over 3 millions highly educated Iranians have immigrated to US , Canada and Europe. Posted: Fri Oct 20, 2006 5:34 pm Post subject: Cyrus The Great Day October 29 In VOA By Ahmad Baharlou, Dr.
October 29 has been celebrated by the admirers of Cyrus the Great, The first King of Kings in Persian Empire as his day. It was in this ... all � day, 539 yeas before Christ, that he entered Babylon with no bloodshed or destruction and declared his decision about freedom and human rights. This program, hosted by Ahmad Baharlou, presents Dr. Esmail Nooriala and Shokooh Mirzadegi's views on this subject and receives calls from all over the world. October 29th is the international day of Cyrus the Great, king of Persia, who declared the first charter of human rights in the world also known as Cyrus Cylinder. Cyrus The Great Is The Symbol Of Unity For Freedom & Human Rights for Over 200 Million People Living In Iran, Tajikistan, Afghanistan, Azerbaijan, Kurdistan, Iraq, Turkey, Lebanon, Syria, Israel, Egypt, North Africa and USA. Why is the First Step For Real Change Celebrating October 29th as Cyrus The Great Day? 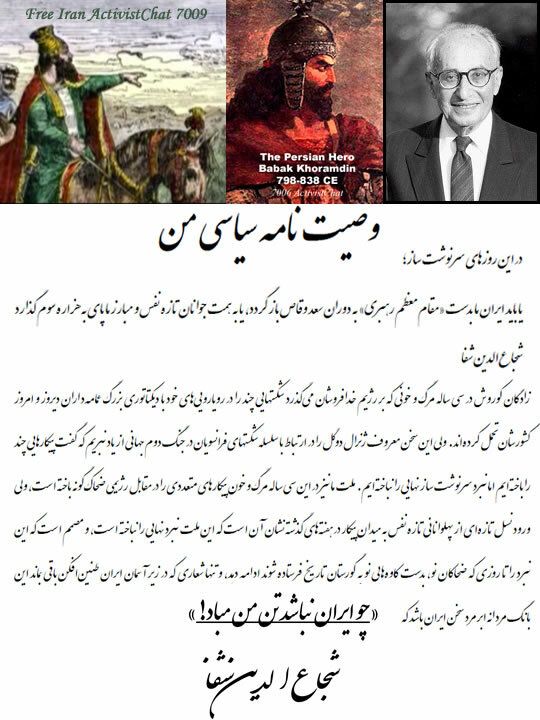 Why Should We Promote To Celebrate October 29th as Cyrus The Great Day?